Last month we presented a "twin" problem by Brian Hinkle. Today's Checker School entry is a bit reminiscent of the "twin" idea. Originally found in Ben Boland's classic Famous Positions in the Game of Checkers, Mr. Boland showed a position in which, supposedly, if Black plays then White wins, while if White plays, then Black wins. 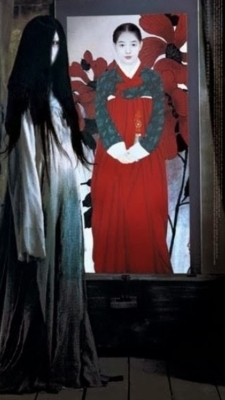 But much to our surprise, we found that, in the original edition of the book, the second member of the twin was in error! The first problem, which Mr. Boland says isn't that difficult for top players, requires quite a lot of nuanced play. It's not a "twin" problem; it's more like the "evil twin." Can you solve both parts? If you can, consider yourself a top player, but in any event, clicking on Read More will show you the solutions, several sample games, and detailed notes and analysis. Lettered notes and unattributed commentary are from Ben Boland. Numbered notes are by the Editor, using the KingsRow computer engine and 10-piece endgame database. There is really a lot here, and it's well worth taking the time to study carefully. Black Plays: 3-7---1, 31-27, 7-11---A,2, 27-23, 11-16, 24-20, 15-18, 20-11, 18-27, 26-22*---3, 27-31---C, 11-8*---4, 12-16---D, 8-3---5, 31-26, 30-23, 19-26, 3-7, 26-30, 7-2, 6-9, 13-6, 30-25, 2-7, 25-18, 6-2. White Wins---6. White Plays: 31-27---E,7, 12-16, 24-20, 14-18, 20-11, 19-23, 26-19, 15-31, 11-7, 10-14, 17-10, 6-15, 7-2, 31-27, 21-17, 15-19, 17-14, 18-22, 14-10, 27-23, 2-7, 22-26, 13-9, 26-31, 9-6, 31-26, 6-2, 26-22, 2-6, 22-18, 30-25, 18-15, 25-21, 23-27, 21-17, 19-23. Black Wins. Game: 9-14, 22-17, 11-15, 25-22, 15-19, 24-15, 10-19, 23-18, 12-19, 17-10, 6-15, 21-17, 5-9, 29-25, 8-12, 25-21, 7-10, 17-13, 2-6, 27-23, 4-8, 23-16, 12-19, 32-27, 9-14, 27-24, 8-12, 22-17. Forms Diagram No. 1. Game: 10-15, 22-17, 11-16, 23-18, 15-22, 25-18, 9-14, 18-9, 6-22, 26-17, 8-11, 27-23, 11-15, 24-19, 15-24, 28-19, 4-8, 29-25, 8-11, 25-22, 16-20, 31-27, 11-16, 17-14, 1-6, 22-18, 6-9. Forms Diagram No. 1, colors reversed. Game: 11-16, 24-19, 8-11, 22-18, 4-8, 18-14, 9-18, 23-14, 10-17, 21-14, 16-23, 27-18, 12-16, 28-24, 16-20, 31-27, 8-12, 26-23, 6-10, 25-21, 10-17, 21-14, 1-6, 29-25, 11-16, 24-19, 6-9, 25-21. Forms Diagram No. 2, colors reversed. Game: 11-15, 22-17, 15-19, 24-15, 10-19, 23-16, 12-19, 25-22, 8-11, 22-18, 9-14, 18-9, 6-22, 26-17, 11-15, 29-25, 5-9, 17-13, 2-6, 25-22, 4-8, 31-26, 8-12, 27-24, 9-14, 22-17, 7-10. Forms Diagram No. 2, but man on 31 is on 32, instead. A---1-5, 27-23, 5-9---B, 26-23. White Wins. B---12-16, 24-20, 7-11, 26-22, 19-26, 30-23, 5-9, 28-24. White Wins. C---14-18, 22-15, 19-23, 11-7, 10-19, 7-2, 6-10, 2-7, 10-15, 13-9*, 27-31, 17-14*, 31-27, 7-11, 27-32, 11-27, 32-23, 14-10, 23-18, 9-6. White Wins. D---31-27, 8-3, 19-24, 28-19, 27-24, 19-16, 12-19, 3-7. White Wins. E---26-23---F, 19-26, 30-23, 15-19, 23-16---G, 12-19, 24-15, 10-19, 17-10, 6-15, 31-27, 15-18, 27-24, 19-23, 24-19, 23-27, 19-15, 27-32, 28-24, 32-27, 24-20, 27-23, 15-10, 18-22, 13-9, 22-26, 9-6, 26-31, 6-2, 31-26, 2-7, 26-22, 7-2, 23-19, 2-7, 22-18, 7-2, 18-14, 2-7, 14-9, 7-11, 9-6, 11-15, 19-23. Black Wins. F---24-20, 15-18, 20-16, 10-15, 17-10, 19-23, 26-19, 15-24, 28-19, 6-24, 16-11, 24-28, 21-17,~28-32, 17-14, 32-28, 31-26, 28-24, 26-22, 18-25, 30-21, 24-19, 21-17, 19-15, 11-7, 3-10, 14-7, 15-10. Black Wins. G---24-15, 10-26, 17-10, 6-15, 31-22, 12-6, 21-17, 16-19, 17-14, 3-7, 14-9, 19-23, 28-24---H, 23-26, 24-20, 26-30, 22-17, 30-25, 17-14, 25-22, 9-5, 22-17, 14-9, 7-11, 9-6, 1-10, 5-1, 15-19, 1-6, 11-15, 13-9, 10-14, 9-5, 15-18. Black Wins. H---9-6, 1-10, 13-9---I, 10-14, 9-6, 7-11, 6-2, 23-26. Black Wins. I---22-17, 23-26, 13-9, 26-30, 9-6, 30-25. Black Wins. 1---Probably best but not good enough. 2---The computer prefers 12-16 here by a small margin. 3---Subtle, and the only move to win. Both 11-7 and 11-8 only draw. 5---And here, 8-4 only draws! 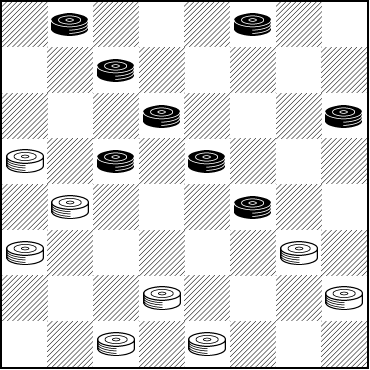 6---One way is 16-19 2-6 18-15 7-11 15x8 6x24 White Wins. 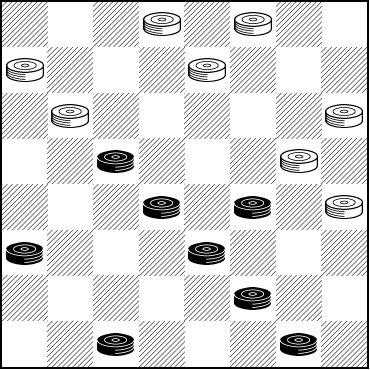 7---This move is incorrect (although for completeness we show all of Mr. Boland's first edition play and notes). White draws with 24-20 and it's very surprising that this was missed for so long. One way is as follows: 24-20 3-8---8,9 26-23 19x26 30x23 15-18 31-27 18-22 27-24 22-25 23-19 25-29 19-15 10x19 24x15 14-18 17-14 18-23 14-9 6-10 15x6 1x10---10 9-5 23-27 13-9 10-15 5-1 29-25 1-6 15-19 6-10 8-11 21-17 19-23 9-6 27-32 17-13 25-22 10-7 23-26 7x16 12x19 6-2 22-18 13-9 18-15 2-7 32-27 9-6 27-23 6-1 and Black can't win. 8---This seemingly natural try doesn't work for Black either: 19-24 28x19 15x24 26-23 24-28 30-26 28-32 26-22 10-15 17x10 15-19 23x16 12x19 10-7 3x10, a database draw. 9---Black can actually lose if he tries 14-18 17-14 10x17 21x14 18-23 14-9 6-10 9-6 15-18 6-2 3-8 20-16 10-15 13-9 1-5 16-11 5x14 11x4 14-17 28-24 19x28 26x10 White Wins. 10---This is now a database draw. This position, variously reached, illustrates the importance of having the move. With Black to play, the student will find the “move” to be in, favor of White, with White therefore being able to win. With White to play, Black has the "move" and the position therefore can be won by Black (unfortunately not so---Ed). Whether, in this position, one is playing the role of the spider or that of the fly can be determined from a calculation of the "move." With the terms, Black to Play; White to Win, the position is commonly known as “Teschleit's Win." After its author, the late Francis M. Teschleit, oftentime Champion of London. The all-inclusive title of “Spider-Web" as applicable particularly to the Diagram No. 2 terms is original, so far as we know, with W. H. Mackasey of Petersburg, Virginia. The Teschleit win is comparatively easy and is hardly ever missed. among experts. Published play however, records a surprising number of instances wherein experts have missed the terms of Diagram No. 2, the "Spider-Web." Your editor wonders how this consistent misspelling crept in. The Checker Maven thanks Jim Loy for information on the name "Tescheleit" and Brian Hinkle for pointing out Ben Boland's emendation in a later, corrected edition of Famous Positions.